Sara B. Chase, a Boston area preservation consultant, has been working in the Arms Family Museum dining room over the past few days. Chase is analyzing the fabric, paint and plaster in the dining room as the first step toward repairing the damage and restoring the room to its original appearance. Additional research and analysis will lead to the production of a detailed report on the various colors on the walls and ceiling, and a treatment plan for the eventual restoration work. Visit the Dining Room Restoration page to view a video interview with Sara Chase about her work at the museum. 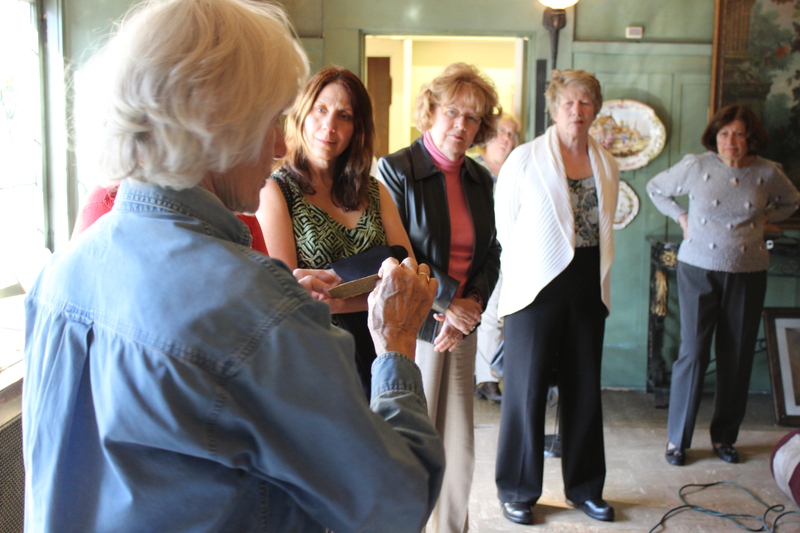 Members of the Historical Society Board of Directors got a chance to meet with Sara and learn more about her work. The Arms Family Museum will reopen Friday, April 4, for regular hours. The Historical Society will host a special admission price weekend at the museum Friday, April 4, through Sunday, April 6, 1:00 to 5:00 P.M., to mark the 50th anniversary of the public opening of the museum on February 22, 1964. During this weekend admission prices will be the same as they were in 1964—50 cents for adults, 25 cents for children age 3-17, and active members of the Armed Forces and senior citizens will be free. Visitors will see the dining room in its un-restored condition and learn about the work to be done in the coming months. A new exhibit, Gotta Dance: Images from the Kotheimer Dance Studios, 1935-1956 will also be opening in the second floor gallery. After the reopening weekend, The Arms Family Museum will resume regular open hours of operation, Tuesday-Sunday from 1:00 to 5:00 p.m., and regular admission of $4 for adults; $3 for senior citizens and college students; and $2 for children 3-18.